Apart from a few references to creating fantasy worlds, my blog posts so far have dealt with how real locations can be used in fiction to make a point about either the underlying theme, the protagonist’s inner workings or any other topic an author would like to present in the sub-text. But sometimes we take our inspiration from very different sources for the landscapes into which we invite our readers. Not from an Atlas, Google Maps or an old-fashioned globe this time, the inspiration for my book cover and – at least in part – the plot for “Master of the Foxhunt” came from a famous painting. The landscape painter and printmaker Winslow Homer (1836 to 1910) is a preeminent figure in American art. His beautiful painting “Fox Hunt”, falling so neatly into the Victorian era my ghost story is set in, was the inspiration for my novella’s cover. The story itself, which had been maturing in my head for a long time, was inspired by a real family of foxes who had taken up residence in my garden shortly after I had purchased a flat in London a few years ago. Since hardly a day goes by where I don’t see the bushy tail or tufty ear of an urban fox disappear around a corner these days, it was about time they took on a starring role in one of my works. My London flat had been on the market for a while and so the garden was rather overgrown, when I purchased it. Imagine a whole row of Edwardian and Victorian family homes with 90-ft gardens arranged back-to-back and you can picture a ready-made urban heaven for foxes. The dilapidated shed that stood in the wilderness of brambles and tall grass at the bottom of my garden was soon transformed into a look-out station from which Mama Fox and her three cubs would survey their little kingdom each morning, when the sun would warm their pelts, while I was floating in the bath. My large picture window of my bathroom overlooked the garden and afforded me an excellent opportunity to spy on South East London’s urban wildlife. The family of foxes didn’t seem to mind. In fact, they were quite the little show-offs, yawning widely and stretching out luxuriously of a morning, turning their little furry bellies towards the warming rays of the early sun, reminding me that their work was done while I still had my working day ahead of me! Winslow Homer’s wonderful painting is on display at the Pennsylvania Academy for the Fine Arts and is one of three Homer masterpieces on show, the other two being “North Road Bermuda” and “Eight Bells”. Oil on canvas and measuring 96.5 b 174 cm, “Fox Hunt” was created in 1893 – eight years after the setting of my romantic ghost story, but close enough! Homer was largely self-taught (like me…but unlike me, he was a hugely gifted painter!). He spent a short time studying oil painting in the spring of 1861, before being sent to the Civil War front in Virginia as an artist-correspondent for the illustrated journal Harper’s Weekly, then a fairly new publication. The time he spent at the front had a profound affect on him and he produced many works about the meaning of war, its impact on people. He was greatly admired by his contemporaries, who found the force of his work and fierce beauty, the drama and dynamic of his compositions deeply moving. Many of his later paintings carry hints of modernist abstraction and I feel “Fox Hunt” is a splendid example of this. He often depicted scenes of hunting and fishing, producing many evocative and much admired seascapes in the process, but here we enter an unforgiving frosty world, an icy countryside that is beautiful, but deadly. “Fox Hunt” was his largest painting up to that point, dealing with the depiction of survival in the wild – a subject largely inspired by Charles Darwin’s theory of natural selection and a topic uppermost on many artists’ minds in the final years of the 19th century. Set in a harsh winter landscape of the Main shoreline, Homer shows us a fox fleeing from a hungry flock of crows. The crow, harbinger of death in mythology for eons, is here not just a messenger but the actual executioner. Looking at the painting one really feels for the fox, its desperate struggle to escape from the trap half-starved crows have sprung on him by ganging up and hunting him as a pack through the deep snow. Homer surprises us with this reversal of fortune, making the fox the prey. The fox has such a bad reputation as the raider of chicken coops, the cunning hunter of small prey, the sly opportunist who’ll steal your Sunday roast from your patio if you don’t watch out. It is indeed one of Homer’s most powerful and memorable images and a true masterpiece. My version, of course, isn’t, as is evident from the book cover! However, given that I had to draw this by hand using a mouse pad and my index finger instead of a sweeping paintbrush…it’s hopefully not too insulting to foxes (I challenge thee, Mr Homer, to try your hand on my mouse pad and do better!). No crows this time, although a cheeky reference to them can be found in my story. As the cover shows, the reversal of fortune in my story involves foxes and humans. Since I find “blood sports” abhorrent and regard those who enjoy them as utterly depraved, expect to find foxes who’ll have the upper paw in my novella. Homer’s “Fox Hunt” was deemed such a powerful work that it became the first of the artist’s paintings to enter a public collection, when the Pennsylvania Academy snapped it up in 1893. What I love about the painting is that our eye is first drawn to the red of the fox’s fur, then the red of the berries of the wild-rose bush, tiny messengers of hope in this harsh landscape, for they signal spring is on its way. With the change of season comes greater availability of food sources for both fox and crow. But then our eye is drawn to the fox’s dark shadow falling across the snow and that implies imminent death – only then do we really take notice of the crows and understand who is the hunter and who the prey in this painting. Writers are always asked where they take their inspiration from. For once I can actually pinpoint what prompted me to write about a foxhunt and why I set the story in the latter part of Queen Victoria’s reign. Just as Homer’s painting is a complex study of the struggle to survive in a hostile world, how writers get their ideas and are able to create landscapes of their mind on paper is a complex topic and a question that isn’t easily answered. My story, initially a straightforward ghost story, soon took a different turn, in that the main characters insisted it should be a love story that leaves readers with a warm glow on a cold winter’s day, not a horror story that sends even more shivers up and down their spines. I was rather miffed at first, but hey, when your main characters pull into one direction and you strain the other way, something’s got to give in the end. The wise thing is to give in and let them have their own way! Published well in time for Valentine’s Day and much better for the hips than a box of chocolates…but just as satisfying! I’ve been reading my way through some of the wonderful murder mysteries and crimes novels from the Golden Age of this genre, now re-issued by British Library Crime Classics. Among them is the once very popular, now almost forgotten writer John Bude, who wrote some 30 best-selling crime novels in his day which are now all but collectors’ items. Having just finished “The Lake District Murder”, which is rather different from his other two novels published in this British Library series, I am once again reminded what a huge difference it makes when a writer knows their “turf”, or locality, and doesn’t just work from a map and tourist guide book. Set in the Lake District in the north of England, the novel is less of a whodunit and more of a how-did-they-do-it. In it, Inspector Meredith must break some pretty solid alibies and solve the murder of a garage co-owner, whose death was dressed up as suicide. As Martin Edwards says in his introduction to this entertaining novel, John Bude “not only knew but clearly loved his Lake District”. And that makes all the difference, for he knows not just the geographical, but also the social landscape of this part of Britain, allowing his readers a glimpse into what life was like at that time in this desolate but beautiful region. There is the middle-aged woman who cooks and cleans, mends and washes in the household of two men for just ten shillings a week; there are the two garage owners who scratch a living for just £16 profit a month, shared between the two of them – which means that each of them had just about a couple of quid to spend per week in 1935, when this novel was first published. There are numerous hotels and pubs that make an excellent living in spring and summer, when masses of tourists arrive, but whose proprietors must fall back on local custom during the rest of the year. Times are hard in rural surroundings like these, and we are reminded of this at every turn but in an understated, subtle way. What is also interesting is that John Bude, in an era when the amateur sleuth was all the rage among writers like Agatha Christie and Dorothy L Sayers, chose to make the policeman Inspector Meredith the central figure of his novel and the painstaking efforts of the police to make the crime stick to the villains so they could be rightfully convicted. No dashing Lord Peter Wimsey here or little old Miss Marple. This feels very much like a real detective at work, doing boring stake-outs hiding behind hedgerows or sifting through endless paperwork. The other central character, if you like, is the Lake District itself, its peculiar geographical quirks as much part of the investigation as the villains themselves. Loving – or detesting – the location a writer uses as background makes all the difference. Even if you create a whole new world for your fantasy novel, you need to feel passionately about the location in one way or another, or you might as well set the whole thing in a void…or a Tesco supermarket isle. Be as passionate about the location as you are about the characters you drop into these fictional landscapes. Your readers will follow their every footstep, so you need to be the world’s best tourist guide! I didn’t adhere to this rule too strictly in the first outing for Linus Brown, when he meets the leprechauns in his new Lincolnshire environment for the first time, but location will play a big, big part when Linus and the leprechaun colony set out to visit Ireland and Castle Blarney in the second outing for my 9-year-old protagonist. Thankfully, I have been to Ireland, albeit not to the castle, but having visited a lot of castles in my day, I can “wing” that part of it, I’m hoping. The Castle has its own website, fortunately with lots of history and some pictures…research, even for a children’s novel, is vital. Finally, at the end of week two of my second promotion for Linus’s first novel, my Copromote adventure bagged me 94 CoPromoters who retweeted my original Tweet with the sales link to Scribd(dot)com to 285,775 followers of their Twitter networks. A round of applause to all of them and a big, fat thank you. 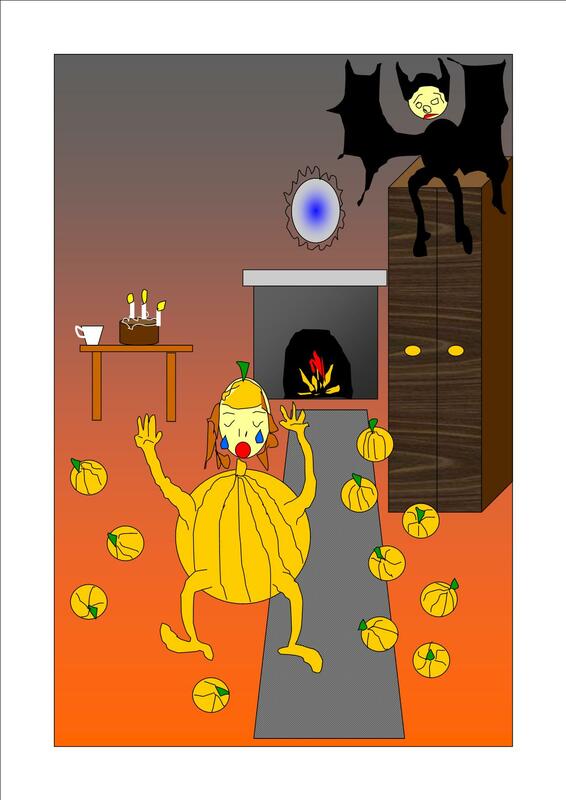 Since the rejection on technical grounds of my ebook, I’ve been busy scribbling away at pumpkin and Halloween related facts in an effort to make the children’s book even better. 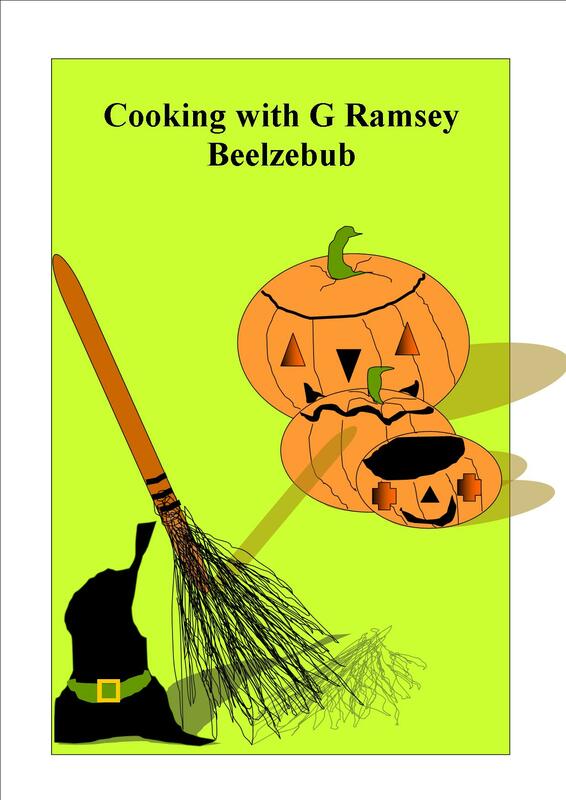 Now it will have pumpkin dishes, pumpkin-growing tips and even more illustrations in it than before. Am also working on a companion piece of The Little Book of Halloween, a book devoted entirely to the topic of ghosts, spectres, apparitions and ghouls. The illustration you see here is the first draft for a picture that will appear in my short story “Cooking with G Ramsey Beelzebub”, an adventure four little girls have when out trick-or-treating. They come across a real witch and things take a turn for the worst from the moment they cross the witch’s threshold…pumpkins, pumpkins everywhere…shooting out of one of the little girls, when the children are magically transformed to become the costumes they are wearing for real. A little bit scary, a little bit funny, the story was written a few years ago for the grandchildren of a former colleague of mine. His grandkids and their friends loved it. Having put the story away for a long time, I looked at it again, worked it over to make it even better, and now it feels right for publication somehow. Hope the girls in question, who are now also a few years older, will like the story just as much now as they did then. What else is in the book? A recipe for pumpkin soup, my very own, of course, and how to grow champion pumpkins without the help of witches. Have a great Halloween, everyone! To my intense irritation I discovered that uploading and publishing anything with illustrations or photographs on Bookrix is a challenge too great for this techno-phobe. Bookrix publishes ebooks and so far I had no problems with them, since all I ever did was uploading a cover and manuscript. Things changed drastically when I wanted to upload my latest book project, obviously well in time for Halloween, since it deals with the origins and folklore of this ancient festival. 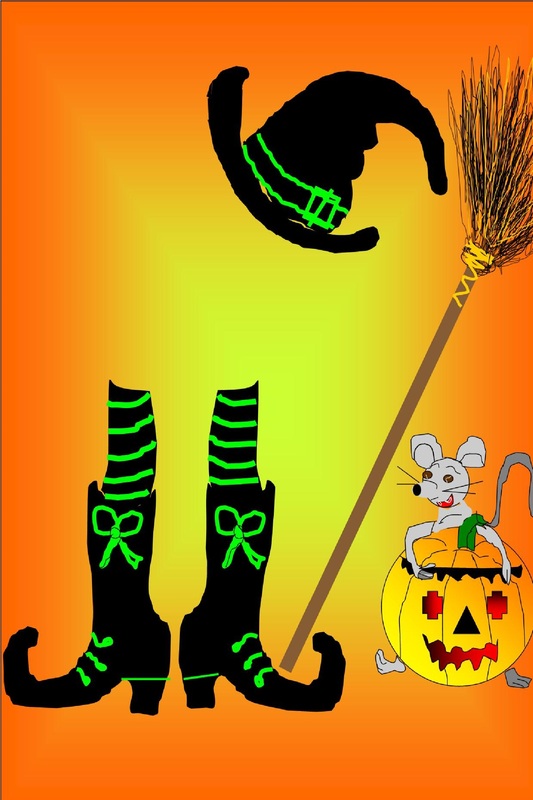 It also features several children’s short stories inspired by the colourful festival of Halloween. The draft book was rejected on the grounds that two – or possibly 3 chapters, the emails I got were a little misleading – were not indented as they should be. Something that was not MY fault. Believe me I tried to set things right. It was the publisher’s software fault. And this is when I discovered that I would have to put the book on “sales stop” first and then wait for a whole 14 days before I could actually delete the thing and publish somewhere else. Given the book is called “The Little Book of Halloween”, not “The Little Book of Easter” or “the Little Book of Christmas”, it seemed utterly ridiculous to even suggest such a thing to me, the person trying to sell in time for a seasonal event. 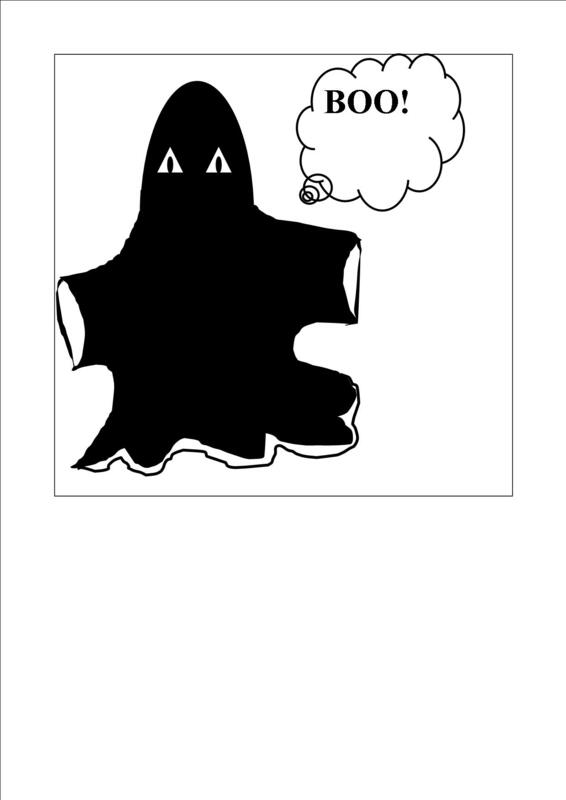 Bookrix’s mean trick-or-treat prank has resulted in a whole series of “The Little Book of…” now, starting with “The Little Book of Ghosts” to be published shortly. So there, take that with a pinch of frog spawn and ground eye of newt, publisher, and gargle well with pumpkin juice afterwards. Wash down the bitter taste of one author voting with her virtual feet! You have been warned, young readers! All of these highly desirable books (from a kid’s point of view) will be uploaded and published somewhere else now. Release date to be announced shortly. Amsterdam around 1662. The ring of canals is now complete. Map of Amsterdam in 1662, with a panorama of Amsterdam included. A little while back I mentioned that I wanted to do another review of a book where a writer had used a specific location to demonstrate a particular point. I didn’t like “Tulip Fever” by Deborah Moggach much, but she does use the city of Amsterdam in an interesting way to mirror what is going on with her protagonists. It’s not only the streets that reflect the plot’s main action – the city of Amsterdam is in the grip of tulipomania (tulip fever), a love-affair as truly, madly, deeply felt by its citizen as the love-affair Moggach’s two protagonists, young Sophia and painter Jan, are about to plunge into. Set in about 1636 during the height of tulipomania, the main action takes place in a rich merchant’s house in the Herrengracht, one of Amsterdam’s most splendid residences overlooking a gracht or canal, then a major thoroughfare within the city. And Moggach mirrors the action not just literally, she reflects it figuratively – what Amsterdam’s respectable burghers get up to is reflected in the ever-present water as well as in numerous paintings commissioned from artists who’ll later become some of the most famous painters in history, including on Jan van Loo(s). This image was originally posted to Flickr by franzconde at http://flickr.com/photos/79928508@N00/6830835593. It was reviewed on 1 January 2015 by the FlickreviewR robot and was confirmed to be licensed under the terms of the cc-by-2.0. Every Hans, Frans and Cornelis wants their painting done – including the rich, elderly husband of Sophia. She promptly falls in love with the young painter, Jan van Loos, during the first sitting and clichéd romance, revenge and divine retribution ensue from this point onwards. What I did like about the novel was the ever-present water as a metaphor for life and death. The peculiar quality water has when reflecting both objects and light suffuses the book, making it an illuminating read in more ways than one. Maria, the maid, dreams of living in her mistress’s house with her as yet unborn six children. In her dreams, Maria and her brood swim through the house in a strange underwater world free of man’s obsessions with tulips, wealth and status. For Maria, water means freedom from domestic servitude and happiness in the bosom of her own family. Water means life, but also death to many. Storms sweep the Dutch coastline frequently, killing Amsterdam’s residents indiscriminately, as the seawater is driven into the grachts. Whole districts get flooded in the process. Dogs, cats, humans rich and poor, they all meet their fate, when water sweeps clean the streets of Amsterdam. 2008: The Gouden Bocht (“Golden Bend”) is the most prestigious part of Herengracht in Amsterdam, between Leidsestraat and Vijzelstraat. Water means earning a decent enough living for a large number of people. Run a barge up and down the Amstel River or trade in the grachts. Maria’s lover Willem earns his living from selling fish. Disappointed in love and robbed of his savings and dignity, he later goes to sea to seek his fortune as a soldier. Water can help people to change their lives. The merchants get rich – or lose everything – by trading with foreign countries, sending out fleets of ships to exotic places. Water, water, everywhere…water-logged streets, overflowing hearts, fortunes lost at sea, tear-stained lovers’ letters and new types of paintings where herrings take centre stage. Water determines the fate of them all. By contrast, the painters of the day, artists such as Jan van Loos or Rembrandt, record the mundane terrestrial, the domestic lives of Dutch burghers – whoever can afford to commission a painting, does so; those who can’t afford to pay, may be lucky enough to attract a painter into their dark and dingy hovel – some artists are keen to record Dutch life of the lower classes. Everybody wants their lives to be captured for eternity, holding off the grim reaper in their own way. Even the land these splendid merchant houses have been built on has been snatched back from the sea and wetlands. If they can do THAT, why not hold on to life for a little longer with the help of paintings? It may only be one fragment of a life captured on canvas, but in their minds that one moment can hold off the inevitable drowning in ever-lasting darkness. It’s the age of discovery, especially in the field of botany. For a brief period in history, Dutch people succumb to a strange mania, buying tulip bulbs for enormous sums and speculating on the flowers as if they were gold or diamonds. Historians and psychologists all over the world are still debating what prompts human beings to enter into such bizarre manias. We can see some of the wonderful flowers these explorers brought back with them in Dutch paintings of the period. Somehow this humble wild flower from dry and arid Turkey and Afghanistan captured the imagination of people like no other plant has done before or since in human history. Neither rose, poppy, lotus nor orchid has caused such manic behaviour or ever commanded such prices. Did the Dutch fall in love with tulips simply because the flowers grew in desert-like conditions in their natural habitats? Did the wild tulip represent a secret longing for terra firma, a place not dominated by water? Moggach’s book creates a strange world out of this fluid, ever-changing medium. You can practically taste the salt on your lips and smell the herring, when Sophia hastens through the dark and empty streets at night to spend time with her lover, when lanterns twinkle on passing barges, when raucous laughter fills the air from all those sailors stepping off vessels that have been to parts of the world, where new types of tulip are only just being discovered. Sometimes a lover embracing you, sometimes a monster swallowing you whole: the grachts of Amsterdam are the veins and blood vessels that run through each and every one of its 17th century citizens. I also liked the idea to set a novel in an era of extraordinary events, when a city is in chaos over something other than war. In this case it’s tulipomania, in Boris Akunin’s novel “The Coronation” it was the crowing of Csar Nicholas II and the start of the first rumblings of the Russian revolution that made Moscow a perfect location for a kidnapping mystery and metaphor for a heart in turmoil. Part 2 of this post will go into tulipomania itself and what historic Amsterdam was like around 1636. But here’s the post about disco dancing on Mars: I went to see “The Martian” movie last night and really enjoyed it. How refreshing to see a hero who’s also a science nerd, a man who only blows things up accidentally, not on purpose (the latter could be called “Expendable-style”). The running joke throughout the film is that the poor man is stuck all alone on Mars with nothing but disco music, left behind by one of his colleagues, when they had to leave the planet in a hurry. It’s hilarious seeing the protagonist driving through stunning Martian landscapes with his hot-rodded Mars-mobile, singing along to Donna Summer! The locations are truly on an epic scale, filmed in a desert where rock formations still look as if some meteor shower had just deposited them there. Here the total absence of buildings, plants, animals and people could be depressing, as the main character faces certain death through lack of water, starvation due to shortage of food reserves or perishing from any number of other horrible things, including running out of air and freezing to death over night. However, he somehow manages to keep his spirits up and help does arrive eventually. As he learns to negotiate a sort of truce with Martian elements and makes this utterly hostile world work for him, our world comes together for the first time on a global scale in a combined effort to bring the American astronaut home. The movie is based on the bestselling novel by Andy Weir and I can’t wait to read it now. Will this Inkstain never go away? 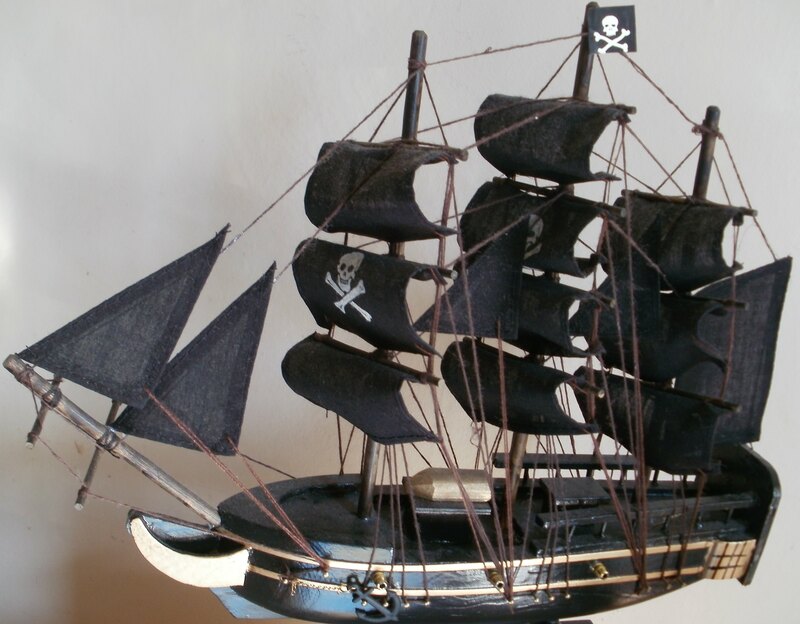 More ink-stained pirates on their way to board the good ship Talent and steal time from it’s crew? Will this Ink-stain never go away? Despite asking their “support staff” to remove my profile from their site, and not to contact me again, I’ve had several emails by Inkitt. Apparently, even unsubscribing doesn’t curb their enthusiasm. Now I’ve just found a mile long message here on WordPress, sent apparently by some site-related person. Naturally, I have trashed their comment equivalent of “War and Peace” without bothering to read more than the first few words of the first sentence. They’ve wasted enough of my time. Any more emails or promo type stuff posted to my WP sites, Twitter or my personal email address will be reported as spam. Get it into your heads Inkitt-people, I do not like your site, don’t want to be seen on it, don’t want to communicate with the site’s operators, friends, uncles, aunts or mothers of the founders, or the founders, judges, janitors or tea ladies nor any of its author members in any shape or (plat)form. Got it? Yes, Createspace! No more tearing one’s hair out over their upload and cover-design process for print books, yay. It seems almost too good to be true. I still haven’t been able to sort out all those irritating pixel-related cover problems of my Willow the Vampire book with Createspace, so this is such good news for me. Negotiations with Amazon and various other outlets are also currently going on with Draft2Digital to expand the book sales territory further, according to the site. Royalty arrangements are satisfactory and generous to authors, another plus point. Now all you savvy self-publishing people out there here at WP probably knew this and it’s an old publishing hat to you, but to me finding a site like Bookrix, where ebook uploading is incredibly easy and painless, is a true labour and nerve-saving blessing. As far as I remember, Bookrix doesn’t sell into Oyster or Tolino, the latter is a huge German book sales market, so that’s another plus point. Only draw back is that print books only come in one size at D2D. Not so good for children’s authors, who are usually looking for a variety of book sizes in order to please readers with small hands and big appetites to point at large pictures. Still. I can live with that. Here’s an update on that most peculiar and frankly useless of all new author platforms: Inkitt. After uploading my submission for their “Wanderlust” competition, I discovered that authors were only granted 200 characters (incl. spaces!) for their bio and there was no space at all to credit the illustrators or artists whose work people had uploaded as their “book cover” for each submission. Worse, the competition rules prevented those who had fan fiction elements or any other copyright issues to report from doing so. We were told in the contest rules to “upload this on our profiles” but there was no space at all to do so. And when I pointed this out to the site’s support team, I received a patronising message back saying “I’ll see if it’s in the budget”, which was headed by “dearest, dearest Maria”. Some snotty-nosed girl who is not only helping to judge the entries but also writes on the site had sent the comment and apparently disabled the reply box in order to shut up this critic. Only the first 10% of entries, equating to only around 20 entries on the first page of the site, will be seen by the judges and then, wait for it, all the winner is supposed to get is a “badge”. Yay…(voice trails off and starts belching in disgust). Entries for the “Romance: Entwined” contest, on the other hand, can expect to be taken more seriously. Why? Because they have to submit at least 40,000 stories to qualify. The site’s founders clearly don’t take the fantasy genre writers seriously, since they could upload at whatever length they wanted and whatever they wanted, including poetry. The fact that there is no children’s writer section and that all ratings start at 13+ also suggests Inkitt is only interested in writers of the most commercially successful YA genres, but not anyone else. Simply because the majority of their “clientele” is going to be poached from Wattpad’s youthful fan base. The goal seems clear: just get as many people as possible to upload certain genre writing as possible, don’t allow them to put profiles with any hint of contact details on the site, because authors whose work has any merit may otherwise be contacted directly by literary agents. They might get snapped up before Inkitt can get their claws into these authors and represent them, I guess, in an agent capacity. All it takes is ONE author’s success…think “50 Shades of Bilge” and count how much 10-15% agent’s fee equates to…they won’t have to continue building their site. The site’s founders can simply retire rich and happy there and then. Can you hear an authors’ platform going down the toilet? Two literary friends of mine, both excellent writers in their own right, looked at quite a large number of the entries, and saw that this was yet another Wattpad-thing-without-artistic-merit. So, when we got an email from one of the founders of the site telling us that, instead of sorting out the urgent copyright infringement issues and total lack of author bio-capacity, they were working on some idiotic button that did nothing to address these issues, I deleted my contest entry and told them to also delete my profile. The email, rather predictably, also urged people to “read” and not just click the “vote” button without staying longer on the site. Naturally, when people don’t read the stories to the full, the founders of the site cannot prove their supposedly super-duper-foolproof-bestseller-finder software actually works. This is, of course, where the whole thing falls flat on its face: my experience has been that the overwhelming majority of readers on these sites are people who simply consume FREE reading material ferociously without EVER voting or liking or “hearting” anything at all, simply because they are too lazy. And the majority of those youngsters who do vote or like or “heart” authors’ works do so only for their own friends’ work, and quite probably without bothering to read the stories. If the friend wins a competition or gets offered a publishing deal…well there are selfie opportunities galore and reflected glory in heaps to look forward to. If any real bookworms out there were trying to find my story, following my earlier blog posts, they can now read “A Road less well travelled” online, for FREE, by becoming Bookrix members. I’ve uploaded the story as an ebook, which is now titled “Linus & The Leprechauns”. It’s free to become a member of Bookrix and the English language side of the platform has a really friendly community with a good mix of young and older, more experienced writers.